I have now officially started on my DQS6 project. I hope my partner likes what I have picked out! I pulled all of the fabrics from my stash. I honestly was hoping to use up more of the stash. 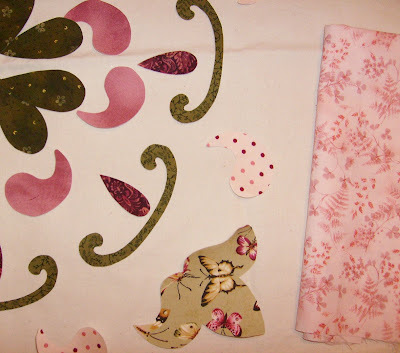 I have like 6 yards of the butterfly fabric and as you can see I only used a tiny bit. 2 4"x4" squares to be exact! 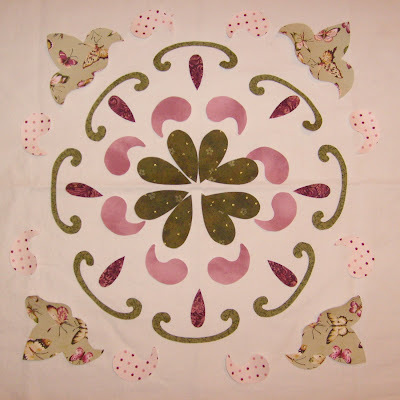 I'm modifying a pattern called "Bandana beauty" from the "Easy Quilts" fall 2008 issue. It's the center panel reduced by 50%. This is the preliminary layout on some off white fabric. All of the colors were pulled from the butterfly fabrics and are deep and vibrant (sorry for the poor lighting.) I'm not sure I like the polka dots. The colors are perfect but I think it gets lost in the layout, not enough of a punch. What do you think? Maybe I'll just have to take a better picture tomorrow during the day in some natural light.